Today I finally found time to go and see Marina Abramovic at the Serpentine Gallery, London. I tried to go earlier in the week but unbeknownst to me, the gallery was shut for their summer party (which judging by the photos was one hell of a bash...!) so today I luckily managed to get in without a problem. 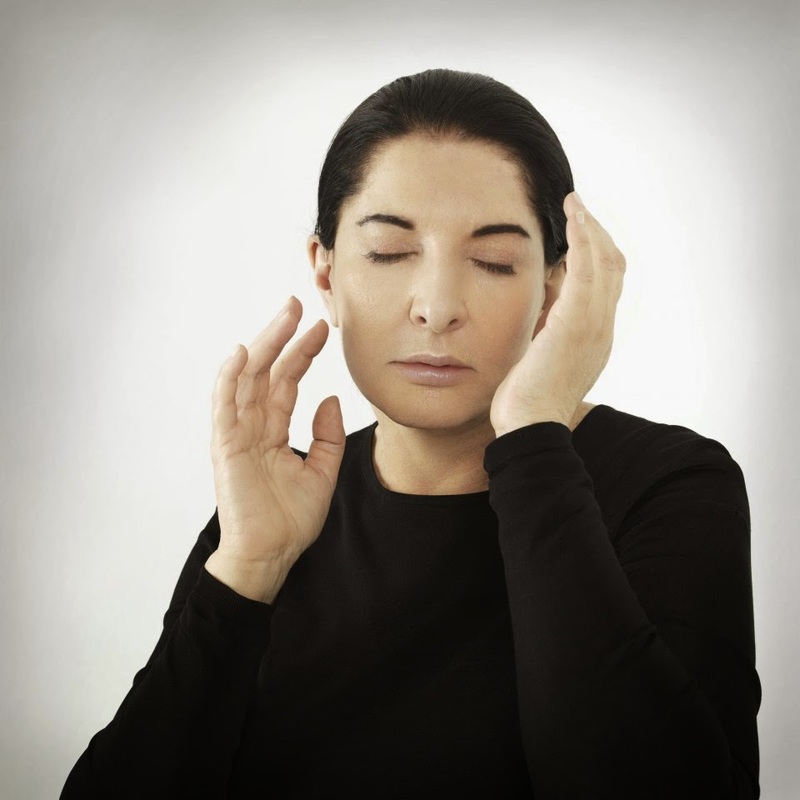 I have to admit that I didn't know much about Marina Abramovic apart from the fact that we share a birthday...! I do know that she is an extraordinary artist with a huge following. The last piece of work she did involved her sitting and staring in silence at random members of the public (over 1,500 people went to see her do that in New York). It was the hottest day of the year so far. And what I witnessed today was unbelievable. I was assured by Rahla who went to see her a couple of weeks ago that I would love it, but I did feel a little apprehensive about the uncertainty of it all having read a couple of reviews / a synopses online. Creating the simplest of environments in the Gallery spaces, Abramović’s only materials will be herself, the audience and a selection of props that she may or may not use. On arrival, visitors will both literally and metaphorically leave their baggage behind in order to enter the exhibition: bags, jackets, electronic equipment, watches and cameras may not accompany them. The public will become the performing body, participating in the delivery of an unprecedented moment in the history of performance art. It was the perfect chance for me to feel completely present - and I surprised myself at how long I managed to sit / lie very still. My mind wandered onto lots of other things but I bought it back and tried to absorb myself into the space and surroundings as much as possible. I loved leaving everything outside and just being with myself. Losing all track of time was also very liberating. Basically, Abramovic is spending 512 hours from June to August in the gallery (6 days a week) and anyone is allowed in or out as many times as they like to take part / experience in the performance / exhibition. I walked in and stood and watched other people for a little while - most were deep in meditation or just had their eyes closed or were possibly even asleep. As well as Marina, there were a few other people helping her "perform" who would spontaneously come and take you by the hand and lead you to the middle and tell you to stand still with your eyes closed (they didn't do that to me so I don't know what they were telling them to do but thats what it looked like). I then found an empty chair so sat on it and placed the headphones that were on the back of the chair on my head. I thought they might be playing music but they turned out just to completely block out all the surrounding sounds. I was then taken by the hand to a little side room which had two long rows of camp beds, pillows and blankets and headphones. I lay on a bed with a blanket over me, headphones on blocking out all sound and this was the BEST bit as it completely made me zone out and forget about the chaos of the outside world. I think I almost fell asleep a few times but a tiny part of me kept remembering that I was lying in a room full of strangers so I couldn't completely let go. I came out after about 1 hour 15 mins and summarised it as "unpredictable, mind boggling and refreshing.." I want to go back as I gather it evolves as time goes on and she uses different props. Its good to go on your own so you can stay / leave when you feel like it rather than being influenced by someone else. Go and see her for yourself - its totally free but you may have to queue - its worth the wait, I promise! I concluded my afternoon with chocolate and caramel ice cream from Gelato Mio - the perfect ending to a great day.